What Else Can I Expect from an Online Master's in Nursing Administration Program? Nursing administrators essentially bridge the gap between medical staff and patients at hospitals, clinics, and other healthcare facilities. These administrators often manage teams of nurses, monitoring their daily work activities and evaluating their on-the-job performance. They may also advise nurses on the best treatment options for different patients. In addition to staff management, nursing administrators may also communicate with patients and their families about diagnostics, medical procedures, prescriptions, and other aspects of their care. Nursing administrators are categorized in the broader career field of 'Medical and Health Services Managers'. According to the Bureau of Labor Statistics, jobs in this field are expected to rise by as much as 17% -- or roughly 56,000 individual positions -- between 2014 and 2024; this demand is fueled in part by both an aging baby boomer population and a sharp uptick in the number of Americans with health insurance. The BLS also notes that professionals in this field earn a median annual salary of $96,540, which is much higher than the national average for all occupations. As a result, fields like nursing administration have become a popular academic choice for today's master's-seeking grad students. The National Center for Education Statistics (NCES) notes that more than 11,000 students earned a master's degree in nursing administration during the 2011-12 academic year alone. Read on to learn more about the challenging -- yet rewarding -- field of nursing administration, as well as tips for finding the best online master's degree in nursing administration programs. WHAT CAN YOU DO WITH A MASTER'S IN NURSING ADMINISTRATION? Graduates with a master's in nursing administration are prepared to pursue careers as nurse administrators, nurse consultants, and health services managers. Read more here..
IS A MASTER'S IN NURSING ADMINISTRATION WORTH IT? A master's in nursing administration is worth it for those who want to advance their career in nursing and pursue managerial positions. WHAT IS A NURSING ADMINISTRATION DEGREE? A nursing administration degree is a graduate program that is geared toward licensed nurses who want to supervise or oversee an entire medical facility's nursing procedures and faculty. WHAT DEGREE DO YOU NEED TO BE A NURSING ADMINISTRATOR? Graduates with a master's in nursing administration can become nursing home administrators by earning a Certified Nursing Home Administrator license. Read more here..
A master's in nursing administration online program will build on the skills you have gained during your undergraduate studies while also introducing new, more complex topics related to this field. The comprehensive curriculum will most likely include coursework in healthcare law and policy, public health, and advanced patient care techniques, as well as administration topics like finance, human resources, office management, and healthcare leadership. Most online nursing administration programs also include practicum (or hands-on) training courses, which are conducted at functioning healthcare facilities and led by experienced professionals. Every online master's in nursing administration pathway is different, so students should carefully research all programs to make sure they align with their learning preferences and career goals. The curriculum is another important consideration, since some programs are more specialized and technical than others; also be sure to research practicum requirements to ensure the program will provide enough hands-on training. Finally, be sure to vet each potential school for student outcomes, such as dropout and graduation rates, post-degree employment trends among students, and school satisfaction scores; also make sure all programs on your list have received the proper accreditation from a recognized accrediting agency. CAN I WORK WHILE I COMPLETE MY ONLINE MASTER'S in NURSING ADMINISTRATION? Some programs are asynchronous, or self-paced, and allow students to complete their coursework without regular class meetings and assignments. Others follow a synchronous (or not self-paced) schedule with weekly assignments and student requirements. Students tend to complete synchronous programs more quickly, but asynchronous options are more conducive to students with jobs, as well as childcare duties and other important commitments. Students who are adept at time management should have no trouble balancing work and school for the duration of their master's in nursing administration online program. WHAT ARE THE ADVANTAGES TO EARNING MY MASTER'S in NURSING ADMINISTRATION ONLINE? Earning an online master's in nursing administration is a flexible alternative to traditional brick-and-mortar education. Students will be able to access lectures and course materials using streaming video and other platforms, submit assignments via email, take tests online, and participate in virtual discussions with their professors and fellow students. Current technology also enables you to study away from home using a laptop, tablet, smartphone, and other portable devices with Wi-Fi access. For added convenience, students with practicum requirements can usually coordinate trainings and face-to-face meetings at locations that are relatively close to their current residence. And ultimately, online and on-campus students receive the same accredited degree, and will be qualified for similar positions once they graduate. Based in Galveston, UT's Medical Branch specializes in training exceptional healthcare leaders. The institution's 39-credit online master's in executive nurse leadership prepares leaders in nursing to influence and advance health locally, nationally, and globally. Executive Nurse Leader (ENL) graduates are positioned to lead change and advance health through collaboration, innovation, and dissemination of new approaches to healthcare that improve individual and population health. The ENL program is based on research delineating the key competencies of successful, transformational leaders: development of self as an ethical leader, interprofessional healthcare planning and delivery, and strategic use of organizational, workforce, and technological resources. Placing an emphasis on competency-based learning, degree seekers dive into 21st century topics related to leading other nursing professionals, as well as healthcare leadership for health and healthcare organizations. All distance learners are required to complete three practicums while enrolled, each of which can be undertaken at an approved facility in their area. This accredited online executive nurse leadership program is available fully online, and part--time students typically earn their degree in two years (or six consecutive semesters). Health professionals interested in UTMB's MSN degree must hold a bachelor's degree in nursing from an accredited program, possess an active registered nurse license, have completed at least one year of experience working as a registered nurse, and have demonstrated leadership experience. Other requirements for admission include a letter of reference, a 700-word personal statement, and an undergraduate degree with a minimum 3.0 GPA. GRE exam scores are not required for admittance to this degree path. Selection metrics used by the admission department include academic performance, nursing experience, leadership potential, awards and honors of distinction, communication skills, and goals for the future. Upon acceptance to the program, students must complete a basic life support course, submit evidence of immunizations, and pass a background check. A private research institution based in Washington, D.C., George Washington University offers one of the best accredited online nursing administration programs in the country. Comprising 36 credits, GWU's program integrates current healthcare practices with business strategies to provide a curriculum that prepares nursing students for leadership roles in a variety of healthcare facilities. In addition to acquiring advanced healthcare and business knowledge, distance learners delve into advanced topics related to health information and technology, healthcare quality processes, biostatistics, and research methods. Standout courses include coverage of population health, nursing leadership, and health economics and finance. GWU admits new degree seekers twice a year, in the spring and fall. Depending on whether or not they are working while completing a degree, classes can be taken part-time or full-time. Students on the full-time track can expect to meet all program requirements within four semesters, while those on a part-time track will finish in six semesters (including two summer sessions). The department is designed for nurses currently working to enroll in the part-time program. Throughout this master's in nursing administration online program, distance learners complete two practicums at local healthcare facilities or agencies that have been approved by the school of nursing. A leadership coaching in nursing course is also taken to reinforce managerial skills that newly minted nursing administrators will need to move into more senior roles. Though the majority of coursework can be completed online from the comfort of a student's home, this program does require learners to visit the school's Washington D.C. campus to take part in an intensive learning session alongside their fellow students. GW's online programs are approved by the State Authorization Reciprocity Agreement, which allows students across the nation to partake in the university's distance learning programs. Only a few states have special stipulations, and the university encourages students seeking licensure to contact their state licensing boards for more information. 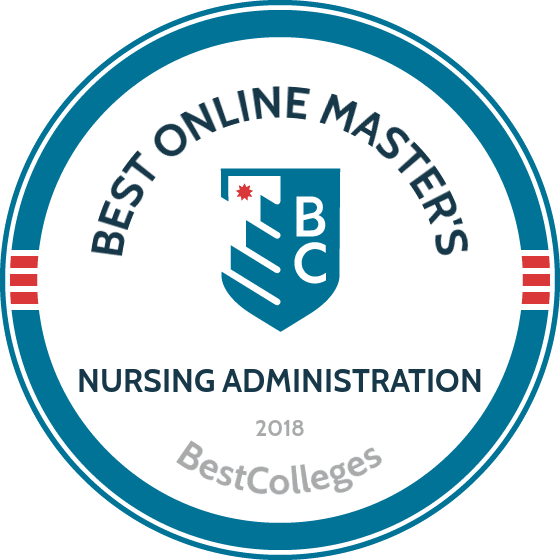 A leader in online education since 1996, Stony Brook delivers a 36-credit online master's in nursing administration that employs a primarily asynchronous format. Appealing to busy registered nurses who aim to advance professionally, the program boasts flexibility by allowing students to fulfill requirements at times best suited to their schedules. This degree path does require a few site visits to participate in campus-based immersions and network with peers and professors. Program curriculum equips students with the theoretical knowledge and evidence-based training necessary to successfully implement ethical healthcare practices that meet community needs. Sample courses include applications in clinical nursing research, finance and economics in nursing leadership, and communication and relationship management. Program graduates have the skills necessary to implement change, improve outcomes, translate research into evidence-based practice models, utilize technologies, and advocate for respect, ethical responsibility, and professionalism amongst all staff. In order to be accepted into this program, degree seekers must provide an application demonstrating the completion of a nursing-related bachelor's degree and transcripts showing a minimum 3.0 cumulative GPA. This application must also include three letters of recommendation, evidence of completing a statistics course, a current professional RN license, and at least one year of relevant experience. Students who hold a baccalaureate degree in a discipline unrelated to nursing must submit a clinical practice portfolio to demonstrate their nursing competencies (applicants following this path must pay an additional $300 clinical practice portfolio fee). Located in New York, Stony Brook University is a public sea and space-grant research institution that is currently home to more than 25,000 undergraduate and graduate students studying locally and online. Located in Omaha, Nebraska, Clarkson is a private institution that's been granting health science-related degrees since 1888. Originally founded within a hospital to offer two-year nursing programs, today the college has grown exponentially but its mission remains the same: to educate the next generation of compassionate and competent health professionals. Clarkson's master's of science in nursing healthcare administration online propels registered nurses into professional leadership roles within the healthcare industry. The 42 semester hour program is available fully online and includes modern, evolving studies in nursing laws and ethics, healthcare delivery systems, role transitions, and strategic planning for healthcare organizations. A series of evidence-based practice research project courses are also included as a means of preparing students for real-world scenarios upon graduation. A nursing healthcare leadership practicum is also included during the final semester. The department is vocal about giving back to communities, and three required classes in this program are designated service courses. Full-time learners typically earn their degree after eight semesters of study, while those enrolled in a part-time capacity take 12 or more semesters. This accredited online nursing administration program emphasizes the development of leadership and planning skills, theoretical and practical healthcare knowledge, and workforce policies and procedures critical to the development and implementation of healthcare delivery systems. Graduates of the program have gone on to meaningful roles in hospitals, clinics, physician offices, nonprofit and governmental agencies, and insurance companies. Applicants to Clarkson's master's in nursing administration online program should hold a bachelor's degree with a minimum 3.0 GPA and should submit transcripts, evidence of valid registered nurse licensure, a resume, an academic essay, and two letters of recommendation with their online application. Students should check with their state authorization and licensure board to ensure this program meets requirements before applying. To prepare registered nurses for rewarding careers at colleges, hospitals, and community health agencies, Regis delivers an online MS in nursing, leadership in healthcare, with a focus on education through its prestigious Rueckert-Hartman College for Health Professions. Unlike other degrees in this ranking with a strict focus on administration and leadership, Regis's focus on education prepares nurse educators who are interested in designing curricula, developing courses, or teaching, mentoring, and evaluating students. The 42-credit online program includes courses in ethics for nurse leaders, healthcare policy, and advanced health assessment. Integrating leadership and nursing theories with business models and family care strategies, Regis delivers a holistic, patient-centered degree for the nation's next generation of advanced practice nurses. Specific courses include curriculum development, evidence-based practice research, advanced pharmacology, physiology and pathophysiology, and advanced health assessment. Common traits of all students accepted to this program include advanced communication skills, critical thinking, a passion for teaching, and creativity in conveying knowledge. The school also offers an online RN to MSN in leadership in healthcare systems. This master's in nursing administration online program features no in-person requirements and is typically completed in two-and-a-half years by full-time learners. Distance students can spend up to five years completing the degree if they are juggling outside responsibilities. Regis structures the program in eight-week terms and delivers course material asynchronously, allowing degree seekers to complete one to two classes simultaneously. Students may enter the program in January, May, or August. Application requirements include three letters of recommendation, official transcripts, a current resume, and a personal statement. The Loretto Heights School of Nursing at Regis is fully accredited by the American Association of Colleges of Nursing -- Commission on Collegiate Nursing Education. The University is accredited by the Higher Learning Commission. Nebraska Methodist College of Nursing and Allied Health has been providing education focused on health services since 1891 and shows no signs of slowing down anytime soon. In recent years, the institution began offering distance education programs to extend its reach throughout the country. One program to come from this expansion was the master's in nursing administration online, an innovative degree path consisting of 36 credits. With a focus on building management techniques and business acumen, the plan of study includes topics in statistical concepts for data interpretation, critical appraisal of knowledge for practice, and the role of the nurse executive. The program also includes two capstone experiences: the first requires students to work with peers in developing an evidence-based project that identifies an issue in nursing, while the second requires them to write a collaborative research paper addressing the issue identified in the first project. NMC's online master's in nursing administration also includes a 126-hour practicum. Distance learners can expect to complete the program online within 21 months of matriculation. Courses are offered in five or 10-week sessions to allow for accelerated learning. Students can expect to enjoy one week off before the start of their next course. Students can access course content 24/7 from any location with an internet connection, making it easy for busy professionals to further their educations while balancing personal and professional responsibilities. To be eligible for admission, applicants should have earned a bachelor's degree in nursing with a minimum GPA of 3.0 and hold unencumbered licensure as a registered nurse. Other admission requirements include a resume, official transcripts, and an essay. NMC does not require applicants to take the GRE. Regardless of their place of residence, all students pay the same per-credit tuition rate. Saint Francis's College of Nursing is responsible for administering the school's master's in nursing administration online program, an innovative two-year degree path. Interactive and cutting edge curriculum prepares nurses for advanced roles as nurse practitioners, nurse educators, or nurse administrators. Reflecting the needs of a dynamic industry, USF's plan of study incorporates courses in healthcare law and finance, ethics and decision making, population health, and evidence-based healthcare practices. Offered as an online master's of science in nursing (MSN) with a concentration in nursing administration, students enrolled in this course of study take a global approach to healthcare management. Degree seekers enrolled in this 36-credit program, which can be completed entirely online, gain skills in business, finance, healthcare roles, and advanced nursing strategies. Also included is a nursing education practicum for distance learners to gain hands-on managerial experience. To graduate with their online master's in nursing administration, students must complete a four-credit capstone in which they plan and implement an initiative to improve the quality of healthcare services. USF delivers its online content using the Canvas Learning Management System (LMS), and discussion forums comprise the bulk of students' online interaction with peers and faculty. Due to State Board of Nursing requirements and a lack of qualified clinical placement sites, applicants to this program must currently be based in Arizona, Illinois, Indiana, Iowa, New Mexico, or Wisconsin. To be eligible for USF's program, applicants must hold a minimum undergraduate GPA of 3.0, have completed two years of full-time nursing practice experience, and possess a valid registered nurse licensure. USF is a Catholic, Franciscan institution with nearly 100 years of experience in providing rigorous educational programs. Its main campus is based in Joliet, a suburb of Chicago. Located in sunny Fort Lauderdale, Florida, Nova Southeastern is a private, nonprofit institution with a long history of providing innovative, forward-focused plans of study. The school's online MSN in health systems leadership is open to registered nurses who hold a bachelor's degree and are interested in pursuing leadership roles in a variety of healthcare settings. The College of Nursing created this program to be flexible and easy, yet rigorous enough to ensure graduates can have their pick of available positions. This online master's in nursing administration program is comprised of 36 credits that can be completed entirely online. Core nursing courses consist of 15 credits, while the remaining 21 are devoted to health systems leadership courses emphasizing decision-making, leadership development, and business economics for healthcare settings. Topics distance learners can expect to analyze include fiscal management in complex health systems, nursing leadership roles in health systems, and providing transformative care. A health systems leadership nursing practicum also allows nurses the chance to step away from their computers and learn from qualified leaders within the field. Designed with the working nurse in mind, enrolled students can expect to finish this program in eight semesters or less, depending on how many courses they are able to take each term. To be eligible for NSU's master's in nursing administration online program, applicants must be registered nurses holding active licensure. If a prospective student's bachelor's degree is in a field other than nursing, they can become eligible by completing an advanced nursing transitional course (which is available at NSU in the fall semester). Application deadlines for fall and winter admission are August 1 and December 1, respectively. NSU uses the Blackboard learning management system and SharkLearn to deliver all of its online classes. Located in Denver, UC's Anschutz Medical campus offers an online master's of science in nursing leadership and healthcare systems for registered nurses who want to transition into professional leadership roles within the healthcare industry. Known colloquially as iLEAD (Innovation in Leadership and Administration in Nursing and Healthcare Systems), this program fosters leadership and decision-making skills while supporting the preparation of distance learners who plan to enroll in a PhD in health systems program upon completion. This online master's in nursing administration is a 30 semester hour program and includes a number of credits in core nursing topics. Unique classes range from advanced pathophysiology and applied evidence-based practice to inferential statistics in nursing and introduction to adult gerontology acute care. Available fully online, degree seekers taking classes full-time typically earn their degree within two years (including summer coursework). Upon completion, graduates possess cultural competencies and enter the sector with the ability to compassionately implement appropriate care. The flexible curriculum uses evidence-based practices and information science to provide up-to-date training through a social justice leadership model that encourages community advocacy and healthcare practices that empower patients. Faculty at UCDAMC are experts in their field, particularly in areas of healthcare systems, informatics, and nursing leadership research. Upon graduation, distance learners will be able to implement caring nursing practice, manage care to achieve cost-effective and ethical outcomes, and engage in self-directed learning to continue facilitating their educations long after leaving school. They will also possess valuable skills in advanced research methods that will assist them both academically and professionally. Distance learners in the program all pay the same tuition rate, regardless of their state of residence. CU-Denver provides scholarships and other financial aid options to its graduate students, based on both merit and need. Sacred Heart's MSN in nursing management and executive leadership is a targeted program that prepares graduates to move into roles requiring administrative responsibility and helps learners develop leadership skills for use in healthcare organizations. Comprising 36 hours, online courses in this online master's in nursing administration program include evidence-based practice for quality care, healthcare information systems, and management of financial resources. A 120-hour clinical practicum is also included to provide degree seekers with hands-on experience in an approved healthcare setting. A nursing management and executive leadership capstone allows distance learners the chance to apply and analyze theories, competencies, and concepts studied throughout the program and then apply them to a real-world issue. Students can expect to finish this convenient master's in nursing administration online program with consecutive, eight-week course sessions designed to accelerate learning. Most distance learners move from matriculation to graduation within two years. Sacred Heart offers six start dates for the degree, and delivers courses asynchronously through the Blackboard learning management system. This program was updated within the last few years to include curriculum additions and modifications that reflect current leadership trends within nursing administration. The school of nursing prides itself on continually reflecting and responding to the needs of the industry, and students -- whether studying online or on campus -- benefit from this devotion to excellence. To be eligible for admission to this online master's in nursing administration, applicants should hold a bachelor's degree with at least a 3.0 GPA, a resume, two letters of recommendation, a professional goals statement, unencumbered registered nurse licensure, and proof of malpractice insurance. Those applying online must pay a nonrefundable $50 fee. The school makes a range of online student services available to ensure every learner is able to thrive from the comfort of their own home. Founded by a coalition of 19 U.S. governors in 1997, Western Governors is a private, online institution that provides educations to nearly 80,000 students throughout the country each academic year. All courses are built around a competency-based learning model that allows students to move at their own pace. This innovative approach allows motivated students to graduate more quickly and pay far less for their degree program. The university's master's of nursing administration online requires 150 competency units (CUs), the institution's equivalent to a traditional credit hour. The majority of licensed RNs receive between 50 and 90 CUs in transfer credit, making it easier for them to finish the program quickly. Topics covered in this RN to MSN in nursing leadership and management include health assessments, population-focused nursing, professional presence and influence, and organizational leadership and interprofessional team development. Newly matriculated distance learners should expect to spend approximately 15 hours per week completing assignments and projects. The average amount of time to complete the program in full is two-and-a-half-years. WGU's online master's in nursing administration is consistent with the American Nurses Association's nursing administration standards and all entrants can rest assured knowing graduates of the program are well respected within healthcare agencies. As part of graduation requirements, students complete a capstone project that demonstrates their competency within topics covered and serves as a professional portfolio for prospective employers. Distance learners also complete a 40-hour practicum at an approved health facility in their area. Students can work with a faculty mentor to develop an individualized program of study for their online master's in nursing administration. Cost-conscious learners will be relieved to know that WGU hasn't upped the price of tuition since 2008 and provides a flat-rate each term. Based in South Orange, New Jersey, Seton Hall is a private Catholic university that provides a rigorous online master's in nursing administration. Established in 1937 as New Jersey’s first college of nursing, Seton Hall University College of Nursing is known for its reputation as a leader in nursing science. The school's online MSN in health systems administration with case management integrates contemporary nursing and business theories to prepare registered nurses with a BSN for leadership roles in diverse settings. Graduates of the 30-credit program -- which students can complete entirely online -- enter the sector skilled in financial management and organizational administration. Program curriculum familiarizes students with evidenced-based research practices, legal issues in healthcare management, and managed care systems, among other topics. The case management focus equips students with the skills necessary to develop and implement healthcare programs that provide patients with the best services available. Course topics include forces of healthcare, theoretical basis of nursing, and nursing research. Admission requirements for this master's program include a degree from an accredited baccalaureate program in nursing, professional nursing licensure, a personal statement, and two letters of recommendation. Upon graduation, distance learners are eligible to sit for the American Nurses Credentialing Center Nursing Administrator examination, or the Commission for Case Management Certification examination. Located at the southernmost tip of Texas, the University of Texas Rio Grande Valley is among the nation's newest institutions of higher education. Created by the Texas legislature in 2013, the school's first students enrolled in 2015. With a commitment to excellence and affordable education, UTRGV emphasizes intercultural fluency and the understanding of different languages, values, and perspectives. Designed to empower professional nurses with leadership skills in healthcare management, the school's accelerated and fully online MS in nursing administration comprises 36 credits delivered through the Blackboard LMS. Program completion takes as little as one year. Core courses, typically seven weeks in length, include statistics in nursing, theoretical foundations of nursing, and nursing informatics. Practice courses include holistic approaches to chronic disorders, healthcare finance, and conflict resolution and negotiation in healthcare settings. Graduates apply technology and interventions in healthcare management research, organization, and policy. Students gain skills in strategic planning and cost analysis in marketing, budgeting, and forecasting within a variety of healthcare settings. The UTRGV program stands out among recently established master's in nursing administration online programs for its offer of a $2000 scholarship opportunity to master's-level nursing students. Applicable to nursing courses only, the scholarship is prorated for the duration of the program. Admission requires a minimum 3.0 undergraduate GPA, a registered nurse license in the student's state of residence, a baccalaureate degree in nursing, and a criminal background check. Admission may also be granted to students with an associate degree in nursing, a baccalaureate degree in another area, and a completed transition to a graduate nursing course. Classes for online learners begin in January, February, and June. A Benedictine college located in Bismarck, North Dakota, UM offers an online BSN to MSN degree in nursing leadership and management for registered nurses with active, unencumbered licensure and an undergraduate degree in nursing with a minimum GPA of 2.75. The school's online curriculum emphasizes the synthesis of advanced nursing techniques and evidence-based approaches to organizational leadership. Courses on topics like human resource management, influential nursing leadership, and healthcare law and policy prepare nurses for managerial roles in a myriad of healthcare settings. This program aims to blend theory and practice to ensure graduates possess the hard skills and academic knowledge they need to thrive in an ever-changing healthcare environment. Comprising 36 semester hours, this online master's in nursing administration requires distance learners to complete two seminar service projects in addition to 500 hours of field experience. All of these offline requirements can be done at an approved agency or healthcare center in the student's area of residence. The courses offered at Mary are known for their flexibility and convenience, allowing busy professionals to balance work, family, and school. The school delivers all courses asynchronously to ensure degree seekers have the ability to complete assignments and projects on their own schedules. Program faculty consists of leading experts in the field who possess the academic knowledge and professional experience necessary to create student-oriented collaborative learning environments. The university offers several financial aid options, including nursing and healthcare scholarships. Admission requirements include two letters of reference, a goal statement, and a criminal background check. Applicants must also provide proof of completion of an undergraduate or graduate statistics course prior to enrolling. This program is accredited by the American Association of Colleges of Nursing Commission on Collegiate Nursing Education. Founded in 1911 and based in Oklahoma City, the OU College of Nursing is Oklahoma's largest nursing program. The OUHSC health sciences complex houses community facilities, hospitals, seven colleges for health professionals, and premier research facilities. Other campus locations include Tulsa and Lawton. The school prides itself on interdisciplinary collaborations, evidence-based practices, community-driven partnerships, diversity, educational access, and lifelong learning. The school offers an online master's degree in nursing administration delivered through the Desire2Learn learning system and requires 33 credits for completion. Courses include leadership of innovation in complex systems, evidence-based nursing practice and scholarship, a three credit elective, and a three credit practicum. Graduates may also pursue a post-master's certificate requiring 18 credits. Full-time students typically complete the program in two years, while part-time students require closer to three years to graduate. OUHSC maintains an office of research to support scholarly activities, research funding for faculty and graduate students, and mentorship for nurses at OU healthcare facilities. Available services include research consultations for grant submission assistance, statistical and data analysis services, and editorial services. Admission requirements for OUHSC’s online nursing administration programs include a baccalaureate degree in nursing, licensure as a registered nurse, a background check, immunization compliance, a drug screen, prerequisite courses in statistics and research methodology, with a C grade or better, and three letters of recommendation. If requested by the faculty, applicants may also need an interview. GRE scores are not required. Application deadlines are April 1 for fall and October 15 for spring semesters. Prospective students should note that, due to federal regulations, online students in OUHSC nursing programs must reside in states participating in state authorization reciprocity agreements. State boards of nursing can provide further information about licensing requirements. Based in Albany, New York, Excelsior College is among the pioneer independent providers of online nursing administration programs. As a private, nonprofit distance learning institution, Excelsior emphasizes expanding educational opportunity to reach underrepresented students in higher education. Established in 1971 by the New York State Board of Regents, and recognized by the Center of Excellence in Nursing Education, Excelsior takes pride in upholding its values of accessibility, equity, inclusion, affordability, trustworthiness, and collaboration. Designed for highly organized, motivated, and efficient working nurses, Excelsior offers a master's in nursing administration focused on leadership and holistic patient-centered care. The program requires a minimum of 38 credits in three phases: 20 for phase I, 12 for phase II, and six for phase III. Curriculum topics include information management, budgets and funding, and building interdisciplinary healthcare teams. Classes for the specialization include theoretical foundations of nursing practice, epidemiology, and management information for decision support. Students also select one elective course and complete a leadership capstone. Application requirements include a baccalaureate degree in nursing and licensure as a registered nurse. With affordable tuition and fees and generous financial support, Excelsior offers a variety of options to suit budget-conscious students. Active duty military members and their families receive reduced tuition rates. Eligible transfer students may receive transfer credits through previous military service, job training, and professional certifications or licenses (including those from foreign institutions). Undergraduate credits for transfer require a C- or above; graduate credits for transfer require a B- or above. Nursing theory courses for transfer must carry a B grade or better and must have been obtained within the previous five years. Lewis's College of Nursing offers enrolled learners an online master of science in healthcare systems leadership. Created with the professional registered nurse in mind, this patient-focused program provides distance learners with the skills and knowledge they need to design and carry out complex healthcare initiatives within a constantly evolving healthcare environment. As an accredited online nursing administration program, Lewis's offering requires distance learners to complete 42 credits that emphasize the integration of compassionate care with cutting-edge strategies and technologies to provide an exceptional patient experience. Students in the online program complete seven core nursing courses and two specialty core courses in financial management and healthcare leadership. In addition, students must enroll in five specialty courses in areas such as business skills or evidence-based performance. At the end of their time at Lewis, degree-seekers undertake a six-credit healthcare systems leadership capstone project. This assignment is comprised of a field experience requiring students to synthesize and apply the knowledge they gained throughout the program to a real-world problem or issue. This experiential learning component of Lewis's online master's in nursing administration ensures that graduates are prepared for the rigors of the career in practice. To be considered for this online master's in nursing administration, applicants must have graduated from a National League for Nursing Accrediting Commission or Commission on Collegiate Nursing Education-accredited program with a minimum 3.0 GPA. They must also possess current licensure as a registered professional nurse and have completed a three-credit statistics course. Two letters of recommendation, a current resume, and a 500 to 600-word essay on future goals must also be included in the application packet. Although Lewis University is private Lasallian institution and tuition at these types of intuitions tends to be higher than at public schools, the university provides a range of merit and need-based nursing scholarships to help offset costs. Since 1912, Saint Joseph's has provided quality Catholic liberal arts education from its headquarters in Standish. In addition to campus-based learners, Saint Joseph's College Online serves nearly 2,500 students in all 50 states and in nine countries. A leader in distance education, SJCM administers a well-respected and rigorous online master's in nursing administration program designed to propel registered nurses with existing undergraduate degrees in the field into meaningful leadership roles. In addition to core coursework on topics like informatics, ethics, and public policy, students enrolled in the online program complete a capstone project and a 135-hour practicum experience. Areas of faculty expertise include critical care, geriatrics, and family medicine. Specialized advanced courses cover a range of topics, including population health and interprofessional collaboration, healthcare financial management, ethical and legal perspectives, and strategic human resources management. SJCM offers online courses in 12-week terms for students who want to accelerate their learning beyond traditional semester-long classes. These 12-week terms run four times per year, providing students numerous opportunities to get started on an advanced degree. Registered nurses who have completed a bachelor's degree in a discipline other than nursing have the opportunity to pursue an advanced degree through the college's RN to MSN fast track program. Students can earn their online master's degree in nursing administration from SJCM without ever setting foot on campus. All degree seekers must earn a passing grade of 83 (B) or higher in each of their graduate level nursing courses to be approved for graduation. Once matriculated, distance learners must complete the program within five years. The college provides online services for distance learners, including academic advising and technical support. Graduates can expect to leave the nursing master's program with the critical thinking skills necessary for success as leaders in the field. UT's Arlington campus, a massive public research institution, is home to an innovative and forward-focused master's in nursing administration online program. A flexible program that typically takes between 18 and 20 months to complete, this degree path incorporates 21st century management theory and core competencies alongside tried-and-true evidence-based practice. The university delivers its rigorous curriculum in a blended format, featuring distance learning and supervised clinical field experience at Texas partner hospitals. Following a designated course sequence, distance learners pursuing their master's of science in nursing administration online complete 12 courses that are five to 10 weeks in length. The expedited nature of this program makes it possible for students to move from matriculation to graduation far faster than if enrolled in other programs. The 30-credit curriculum features courses on topics like financial management in nursing, nursing management in the healthcare environment, principles of research in nursing, and nursing informatics. Examples of online electives include curriculum development and evaluation and teaching/learning theories, strategies, and evaluation. Distance learners interested in gaining an advanced nursing educator certificate may elect to complete an additional 12 credits alongside their online master's in nursing administration program. Prospective students interested in the program should hold a bachelor's degree from a regionally accredited institution along with an unencumbered registered nurse license. This online program is currently not available to students who reside in Alaska, Maryland, Massachusetts, Nebraska, New York, North Carolina, North Dakota, Oregon, Tennessee, or Washington. The College of Nursing and Health Innovation at UTA is fully accredited by the Commission on Collegiate Nursing Education. Regardless of their place of residence, all degree seekers pay the same flat rate of $17,800 for tuition, and the school makes departmental scholarships available to help offset costs. UT's Tyler campus recognizes that the healthcare industry is an evolving field with dynamic demands. Nurse administrators have the opportunity to fill vital leadership roles and provide direction for the future trends in quality healthcare. The university's 36-credit, online master's degree in nursing administration, which has no mandatory in-person components, endows students with the knowledge and skills necessary to successfully oversee healthcare organizations. Experienced faculty members, who interact with students via instant messaging, videoconferencing, and email, provide quality online instruction and academic support. UT-Tyler's engaging online coursework provides students with ample opportunity for collaboration and meaningful peer interaction. The program's curriculum focuses on three key areas: healthcare leadership, business management, and delivery of care. Courses newly enrolled degree seekers can expect to take include legal, regulatory, and financial management, leadership in the healthcare environment, and healthcare informatics. Aside from two capstone projects, distance learners enrolled in the program also complete a 112-hour practicum at an approved site in their home state. Toward the end of the program, distance learners can decide to either write a master's thesis or undertake a scholarly project. Admission to the program takes place in the fall and spring, with deadlines falling on March 15 and October 15, respectively. In order to apply, future students must show proof of completion of a bachelor's degree in nursing with a minimum GPA of 3.0 achieved in the final 60 credits, proof of current nursing licensure and CPR certification, an admissions essay, three letters of recommendation, and a resume. Students looking to take their learning to the next level may also be interested in the university's dual MSN/MA program (also offered fully online). All courses are delivered asynchronously to ensure online students have the flexibility they need to thrive. Tuition: In-state - $744 for first credit, $301 for each subsequent credit. Non-resident - $1,115 for first credit, $722 for each subsequent credit. Winona State, a public institution based in this historic town of Rochester, Minnesota, offers students an innovative online master's of science in nursing and organizational leadership that equips registered nurses with diverse skill sets and prepares them for leadership roles in a variety of healthcare settings. This online master's in nursing administration program requires students to complete 43 credits, and the school makes part and full-time plans of study available to accommodate individual student needs. The two-year program mandates that distance learners begin their studies during the summer term if they haven't already completed a statistics course. Otherwise, learners can begin in the fall and expect to spend four semesters in school. The part-time program typically takes three years and six semesters to complete (or seven if the statistics pre-requisite must be completed). Boasting a diverse faculty with clinical experience in numerous areas, the program features a curriculum that interweaves advanced nursing theories, managerial strategies, and scholarly research. Standout classes include quality healthcare delivery, nursing information management and decision making, evidence-based practice, and advanced health promotion for families. Aside from coursework, students also complete a total of 420 clinical hours as part of practicum requirements. To be eligible for WSU's online master's in nursing administration, applicants must hold a bachelor's degree in nursing with coursework in physical assessment, nursing research, and statistics. Applicants must also provide evidence of an active and unencumbered nursing license alongside evidence of at least one year of clinical nursing experience. Other admission requirements include evidence of a minimum undergraduate GPA of 3.0, a statement of professional goals, three letters of recommendation, and a background check. To help offset the cost of gaining an advanced degree, the Winona State University Foundation provides a range of merit and need-based scholarships available exclusively to graduate nursing students. Kennesaw's online MSN in advanced care management and leadership is a 40 semester hour program designed specifically for registered nurses living in the state of Georgia. To be eligible for entrance to this program, applicants must hold an undergraduate degree in nursing with a minimum GPA of 3.0. They must also currently hold an active registered nurse license for the state of Georgia. Other admissions requirements include two letters of recommendation, a statement of personal goals, official transcripts, and recent GRE scores. As part of this program, degree seekers complete a nursing administration and health policy track to prepare for a myriad of leadership and managerial roles within healthcare settings. This track emphasizes evidence-based practical skills training, with online courses focused on topics like transformational leadership skills, ethical decision making, leadership strategies in development and implementation, and global initiatives in healthcare. Graduates of KSU are respected in the field for being well-versed in advanced nursing theories and organizational leadership strategies. Once they have matriculated, distance learners typically finish this program within 15 months. Students with existing graduate credits can transfer up to nine of them when they begin the program. In addition to course content, students must complete three practicums. During the spring semester of the first year, the practicum is 90 hours. During that summer, another 90-hour practicum must be completed. During their final fall semester, students must complete a final practicum lasting 135 hours. In order to be cleared for graduation, students must obtain a grade of 'B' or better in all completed courses. Although all coursework can be completed online from anywhere in the state, students enrolled in this master's in nursing administration online program must come to campus between one and two times per semester for intensive learning sessions. Carlow is a private coed Catholic institution in the heart of Pittsburgh that reaches beyond its campus to offer registered nurses across the nation the opportunity to advance their careers. The university's online master of science in nursing, education, and leadership is a 33-credit degree with no in-person requirements. Carlow's program equips students with the skills necessary to fill vital leadership roles in nursing administration, clinical practice, and academia. The curriculum, which emphasizes ethical conduct and professional collaboration, covers topics like evidence-based practices, leadership styles, and nursing leadership theories and strategies. Subjects covered include healthcare innovation and quality, nursing leadership, and leadership in healthcare ethics and policy. Comprising 33 credits in total, Carlow's accredited online master's in nursing administration program culminates in an interactive internship at an approved facility or agency near the student's place of residence. Standard, semester-long courses are woven in with Carlow Accelerated Program classes, a series of eight-week sessions that allow students to complete the program more quickly. Full-time students can expect to earn their credentials in less than two years. Degree seekers with expanded aspirations may also elect to complete a dual MSN and MBA program. This 51-credit program can be finished in approximately two-and-a-half years exclusively through online learning. A range of post-master's certificates are also available to students looking to hone their skills in particular areas. Degree seekers hoping for acceptance into the program must possess a bachelor's degree in nursing obtained through an accredited institution and with a minimum GPA of 3.0. They will also need to hold an active registered nurse license. No GRE or GMAT score is required to for admission. Carlow offers a variety of scholarships and grants, including two graduate scholarships exclusively for nursing students. In addition to boasting the distinction of being the largest private college in Indiana, the Marion campus of IWU delivers one of the best online master's in nursing administration programs in the country. This program provides registered nurses with the opportunity to pursue academic and professional goals, all the while never setting foot on campus. The flexible format of the program, which enrolls students 4 times per year, allows distance learners to begin programs quickly through the accelerated format, which allows them to complete their degree in approximately twenty-five months. Degree seekers who want more community in their education may also be drawn to the cohort fashion of IWUM's offering, which allows ample peer interaction and support to make distance learning a collaborative, engaging experience. The 41-credit program boasts experienced instructors who strive to promote student success and adhere to the university's Christian principles. IWUM's curriculum integrates advanced nursing practices with organizational theories to prepare students for leadership roles in a variety of healthcare settings. Examples of courses in this online master's in nursing administration program include: Nursing Leadership and Human Resources, Advance Nursing Management, Management of Healthcare Delivery Systems, Ethics and Health Policy, and Organizational Behavior. Upon graduation, alumni are eligible to apply to numerous credentialing bodies for certification. In order to be accepted, applicants must hold a BS in nursing from an accredited program. RNs with a baccalaureate degree in an unrelated subject may apply for admission, provided they can show a minimum of 10 years in nursing practice and are able to pay a non-refundable fee of $200 for a portfolio review. Applicants must also hold at least a 3.0 GPA, possess three letters of professional reference, pass a criminal history background check, and provide proof that any nursing license -- current or inactive -- is unencumbered. Students must earn their degree within four years of enrollment. At Idaho's Northwest Nazarene, learners can count on two things when they enroll: that they'll receive a quality Christian liberal arts education and that they'll get to be part of one of the best online master's in nursing administration programs in the nation. For more than 100 years, NNU has served students of all backgrounds, and that mission continues with the expansion of its distance learning opportunities. The university's accredited online nursing administration program accepts registered nurses with or without a bachelor's degree. Those who hold an undergraduate degree in the field are allowed to complete the university's 36-credit, fully online MSN with an emphasis in leadership and education in two years. Degree seekers without baccalaureate credentials typically complete the program within three years. The online curriculum equips students with the knowledge and skills required for leadership roles at healthcare facilities, academic institutions, and community agencies. The program reflects NNU's Christian roots, and online students engage in coursework that promotes spiritual growth as well as advanced nursing skills and organizational knowledge. Unique course topics include leadership perspectives for advancing the profession of nursing, evidence-based practice for graduate nursing, and principles of teaching and curriculum development. All degree seekers must also complete two internships focused on the role of the nurse educator in various healthcare settings. Distance learners take courses consecutively in five-week sessions, dedicating at least 12 hours per week to their studies. This accelerated course schedule makes it possible for students to complete the program in less than two years if they aren't also working full-time. Graduates of the nursing program are ethical leaders who value community advocacy and evidenced-based practices. NNU allows admitted students to transfer up to 25% of the graduate-level credits they've earned within the previous five years toward their master's online. Before Penn State launched its online World Campus in 1998 and became a leader in online education, the institution had long distinguished itself as a pioneer in distance education, with initiatives reaching all the way back to 1892. Today, PSU's World Campus serves nearly 15,000 students across the globe by providing well-regarded and flexible degree programs. One of the school's more popular options is its online master's in nursing administration, a 37-credit master of science in nursing designed for registered nurses who are ready to take their career to the next level. PSU's accredited online nursing administration program serves as a precursor to national certification and works to prepare students for a variety of leadership roles. Titles held by program alumni include nurse executive, chief nursing officer, and healthcare consultant. Without ever setting foot on the State College campus, distance learners can gain the skills and knowledge they need to implement evidence-based best practices and research findings in a confident manner. Available to any registered nurse with US licensure and a bachelor's degree in nursing, the program includes three core courses that explore theoretical foundations of nursing and research. Additionally, the curriculum features courses on topics like healthcare economics, human resource and workforce issues, and leadership concepts. While degree seekers are allowed to start this program immediately, the institution also offers a nurse administrator graduate certificate and a nurse educator graduate certificate. If students complete these before enrolling in the MSN program, all the required credits from the certificates can be applied toward degree requirements. In order to qualify for graduation, students must pass a criminal background check and then complete a 180-hour clinical practicum. They must also participate in a three-credit capstone project designed to highlight program takeaways and provide a professional portfolio. The application deadline for summer/fall admission is February 15. Learners seeking admission for the spring semester must have their application materials in by September 15. With campuses located in Dobbs Ferry, Manhattan, Bronx, and Yorktown, Mercy College is among the premier educational institutions in the New York City area. Founded in 1950, Mercy boasts an emphasis on affordability and a commitment to expanding access to demographically underrepresented students, including first-generation college students and those with high financial need. Designed for part-time students, the school's online master's degree in nursing administration is a 36-credit program that can be completed in either four semesters during a 15-month program with fall admission only; six semesters with two courses per semester in the fall, spring, and summer; or more than six semesters depending on the number of courses taken each semester when admitted. Students may take up to five years to finish the requirements for the degree. Core courses, comprising 15 credits, include health policy, computer technology, philosophical foundations of nursing, and research methods. Specialization courses, consisting of 21 credits, include healthcare financing, strategic planning for healthcare organizations, measuring and enhancing organizational performance (quality), and a final practicum covering application of advanced nursing management principles. Students are advised by graduate faculty in an individualized manner, taking into consideration the student’s preferences related to the timing of progression. Resources for students also include The Mercy College Center for Academic Excellence and Innovation which assists graduate students in persisting in studies and succeeding in coursework, with the goal of graduation. Writing and research specialists assist graduate students through one-on-one assistance both on campus and online. Admission requirements include a baccalaureate degree in nursing and licensure as a registered nurse. Eligible transfer students may receive up to six transfer credits for coursework completed within the previous five years at a B grade or higher. Affiliates of Suburban Hospital Alliance, New York State Nurses Association, and 119 Local Health Care Workers receive a 15% discount on tuition. For scholarships applicable to graduate nursing programs, students should check with Nurses Educational Funds (NEF), a nonprofit organization providing scholarship funds to assist nurses with baccalaureate degrees in pursuing graduate study. Chicago's Saint Xavier University takes a unique approach to nursing administration education by providing an online MSN in executive nurse leadership. This dynamic program was created to provide professional advancement to students seeking to positively impact the healthcare industry. The program provides the administrative skills and nursing knowledge needed for graduates to fill key niche roles among medical professions. The unique dual emphasis on advanced nursing practices and business skills prepares students for rewarding careers as unit directors, nurse managers, chief nursing executives, and head nurse coordinators. Common places of employment include hospitals, doctors' offices, hospices, and rehabilitation centers. SXU's 35-credit master's in nursing administration online includes 18 credits of core courses and 17 credits of specialty courses. Core courses focus on several key topics, including theoretical approaches to advanced nursing, working with diverse populations, and the American healthcare system and financing. The specialty courses, covering subjects like advanced healthcare finance and advanced health and social policy, closely examine the nature of administrative leadership in nursing. Other overarching aspects of nursing practice covered include budgeting, project management, strategic planning, regulatory compliance, and conflict management. In order to graduate, students must complete a capstone experience requiring them to work with faculty in developing a project that incorporates career interests at a practicum site. Students are responsible for identifying an approved practicum site and the program has no residency requirements. Once they have completed all coursework, students are qualified to sit the Nurse Executive, Board Certification exam (NE-BC) or the Nurse Executive, Advanced Board Certification exam (NEA-BC). Applicants should hold a bachelor's degree in nursing, at least a 3.0 GPA on baccalaureate coursework, a current registered nursing license, and at least one year of full-time work experience. Other items applicants need when submitting an application include official transcripts, three letters of recommendation, and a resume. Located in Green Bay, Wisconsin, The University of Wisconsin-Green Bay offers seven fully online undergraduate degree programs and four online graduate programs, including a master's of science in nursing with a specialization in leadership and management in health systems. The University of Wisconsin’s MSN leadership and management in health systems program is designed for working nurses who already hold a bachelor’s degree in the field. Degree completion requirements include 34 credits of coursework, which culminate in a capstone project that should be publicly disseminated (e.g., an article or manuscript). Courses cover leadership in health systems, program planning for population health, informatics in health systems, and financial management in health systems. Upon graduation, students may take the American Nurses Credentialing Center certification exam once they amass sufficient experience. To gain admission to this program, applicants should hold a bachelor’s degree from an institution accredited by a professional nursing organization (e.g, National League for Nursing Accrediting Commission, Commission on Collegiate Nursing Education). They also should have obtained a 3.0 GPA or higher and received a C or higher in a college-level inferential statistics course. No standardized exams like the GRE or MAT are required. The University of Wisconsin-Green Bay is accredited by the Commission on Higher Learning and the Commission on Collegiate Nursing Education. Established in 1923 and based in Beaumont, Texas, Lamar University is a proud member of the Texas State University System and ranks among the fastest growing institutions of higher education in Texas. Recognized for its success in helping disadvantaged students graduate and establish careers, LU has maintained a strong commitment to affordability and accessibility in higher education for over 90 years. Lamar takes pride in the ethnic and economic diversity of its student body. Designed to equip working nurses with strengthened skills in theory, research, and clinical practice, Lamar's online master's degree in nursing administration comprises 37 credits, 22 of which are specific to nursing administration. Classes take place through the Blackboard learning system and span eight weeks in duration. Most students complete the program in two years. Coursework includes healthcare policy and finance, health information systems, role development for nurse administrators, and two administration practicums. Graduates apply expertise in assessment and improvement of cost-effectiveness and quality of healthcare, strategic management, resource management, and creating a supportive, safe, and inclusive practice environment. Lamar's online library provides around-the-clock access to library materials, and students also receive access to library collections at 51 other publicly funded educational institutions through the TexShare program. Admissions requirements include a minimum cumulative GPA of 3.0, a baccalaureate degree in nursing, a college statistics course, and licensure as a registered nurse. Designated as a military friendly school, LU is a member of the Servicemembers Opportunity Colleges Consortium and waives application fees for active duty military members. Eligible students may also transfer credits from previous military training and receive credit by examination. Founded in 1957 in Edwardsville, with its main campus overlooking the Mississippi River’s beautiful bottomland, Southern Illinois University-Edwardsville is a metropolitan institution with a commitment to diversity, service, and sustainability. With additional campuses in Alton and East St. Louis, SIUE is home to a diverse and student-centered educational community. The school's enduring values include wisdom, citizenship, inclusion, integrity, and excellence. In keeping with its rich tradition of civic engagement, SIUE encourages student participation in volunteering and service learning. Coursework for SIUE's 33-credit online nursing administration master's program takes place fully online. The program also requires 315 clinical practicum hours at faculty-approved sites. Distance learners can complete their studies in approximately two years at a rate of six credits per semester. Courses include biostatistics/epidemiology, healthcare informatics, management of human resources in healthcare, and quality and safety for nurse executives. Students complete a rigorous final evidence-based synthesis project, including a broad literature review and an oral presentation of their findings to students and faculty. With appropriate work experience in nursing administration, graduates may pursue credentialing as nurse executives through the American Organization of Nurse Executives Credentialing Center and the American Nurses Credentialing Center exams. Graduates may also pursue a post-master's certificate in healthcare and nursing administration, requiring 21-33 credits. Admission requirements include licensure as a registered nurse, a baccalaureate degree in nursing, three reference letters, a minimum 3.0 GPA, a prerequisite undergraduate class in statistics with a grade of C or better, a drug screen, a criminal background check, and a potential interview. Application deadlines are March 1 and November 15. Residents of Arkansas, Indiana, Iowa, Kentucky, Missouri, Tennessee, and Wisconsin receive in-state tuition. Since clinical arrangements are not available in all states, interested out-of-state students should contact the assistant dean of graduate programs to discuss practicum requirements. Founded in 1914 as a school of nursing based in Roanoke, Virginia, Jefferson College is a private, professional health sciences institution focused on producing competent, knowledgeable, caring, and ethical professionals. The school boasts a 93% pass rate for first-time nursing licensure and certification exams on first attempts. In addition, over 96% of graduates gain employment within six months of graduation. Designed for working nurses, Jefferson's online nursing administration program comprises 36 credits. Students work in small cohorts and typically complete the program in four semesters of full-time study or six semesters of part-time study. Coursework includes organizational behavior and theory, population diversity, collaboration and interprofessional leadership, informatics and data management, and administrative residency. The curriculum meets requirements for national certification exams. Coursework is delivered through the Blackboard learning system with optional face-to-face learning opportunities. Students must consult with faculty to arrange for an on-site clinical practicum. Access to the technology service center and library resources, such as databases and eBooks, are available to online students around the clock. Admission requirements include a minimum 3.0 GPA, licensure as a registered nurse, an undergraduate statistics course with a grade of C or higher, and three letters of recommendation. For holders of non-nursing baccalaureate degrees, required prerequisite courses include contemporary nursing issues with a grade of B or better and a research methods course with a grade of C or better. Students apply through NursingCAS, the centralized application for nursing programs. The priority admission deadline is November 1, with applications accepted year-round. Jefferson offers a recorded online information session for prospective students. Note that the school cannot accept students from the state of Massachusetts due to state and federal regulations. Established in 1934 and based in Jacksonville, Florida, Jacksonville University is a private, nonprofit institution with a strong liberal arts foundation and a mission to prepare students for lifelong success, service, achievement, and leadership. The school's online nursing administration program focuses on leadership in healthcare systems and comprises 30 credits. Classroom learning occurs entirely online in an asynchronous format. All interaction with classmates and faculty takes place through discussion boards, email, and chat rooms. The ten required courses span eight weeks, with four of these courses concentrating on leadership and healthcare systems. Most students complete the program in two years. Core courses, comprising 18 credits, include information systems for improved healthcare, organization, delivery, and policy in healthcare. An advanced role practicum completes the program. Concentration courses, comprising 12 credits, include financial management of nursing systems and human resource management in healthcare. Students may also select one elective and an optional capstone in nursing theory and research. The curriculum and practicum meet educational requirements for certification through the American Organization of Nurse Executives, positioning students to pursue professional certification. Students pair with an academic advisor and work closely with a representative from student services to ensure academic success. Admission requirements include licensure as a registered nurse, a minimum 3.0 GPA, a baccalaureate degree in nursing, an undergraduate statistics course with a grade of C or better, and three letters of recommendation. Students with GPAs below 3.0 may submit GRE scores for admission consideration. Students may enroll anytime and can choose from six start dates per year. Members of the military -- active duty, reservists, veterans, spouses, and dependents -- receive a 10% tuition discount. With locations in Denton, Houston, and Dallas, TWU is the largest university specifically tailored for women in the nation. The school's online master's in nursing health systems management with a minor in healthcare administration emphasizes collaboration and professional advocacy. Depending on the number of electives taken, distance learners can expect to complete 42 to 45 credits over the span of two to two-and-a-half years. Throughout the plan of study, the curriculum integrates theories of nursing, business, and management to provide students with a comprehensive approach to nursing leadership. As they earn their degree, online students learn how to use knowledge of healthcare policies and data analysis to implement appropriate organizational strategies. Individual classes required of all students include policy and health promotion, fiscal assessment, and nursing health systems management: challenges and opportunities. A series of practicums in areas of budgeting, organizational assessment, and outcomes assessment are included in the curriculum and require 90 on-site hours each. Degree seekers will be paired with experienced nurse leaders for each practicum. As an accredited online nursing administration program, distance learners are eligible to complete 50% of the requirements via the Blackboard learning management system, while the remaining 50% must be completed at the university's Houston campus. Applicants to TWU's online master's in nursing administration must submit evidence of professional liability insurance and licensure. Application deadlines for fall and spring are May 1 and September 15, respectively. In addition to standard admissions requirements (e.g. recommendation letters, a resume, and official transcripts), applicants must also provide GRE scores. Similar programs offered at TWU include a post-master's certificate in nursing health systems management and an RN to MS in nursing health systems management. An MSN in nursing health system management with a minor in business is also an option. Located in Charlotte, North Carolina, Queens University of Charlotte offers five completely online graduate degrees including an online master's of science in nursing. This degree offers three possible concentrations: clinical nurse leader, nurse administration, and nurse education. Queens University of Charlotte’s online master of science in nursing program with a specialization in nurse administration culminates in a capstone project and can be completed in as few as two years. It is designed to prepare students for a future working as a member of an interdisciplinary executive team. Courses cover health policy, informatics in healthcare, management of clinical outcomes, and principles of clinical evaluation. The nurse administration track requires 150 residency hours, wherein students take on a nursing administrator role with a local healthcare organization. Queen's University of Charlotte's online MS in nursing also prepares students to apply for the Certification of Nurse Executive offered by the American Nurses Credentialing Center (ANCC). While this certification is not required for employment as a nursing administrator, it serves as a verification that a candidate possesses both adequate clinical knowledge and managerial skills within the nursing field. The best online master's degree in nursing administration programs emphasize advanced training in nursing theories and healthcare management and utilize evidence-based practices to guide instruction. While the details may vary depending on the school, the following information provides an overview of an online master's in nursing administration. Nursing Leadership This concentration prepares students for leadership roles in the field. You will gain skills as a nurse administrator and become familiarized with topics ranging from workforce management to disease prevention. Nursing leadership students are prepared for careers as nursing directors and chief nurse executives at hospitals, clinics, and extended care facilities. Health Systems Management This focus emphasizes interdisciplinary collaboration and program evaluation. You will learn how to manage nursing financial resources and utilize outcome data to promote health. A concentration in health systems management allows you to pursue careers in health education, program management, and consultation. Health Administration A nursing degree in health administration prepares students for team-centered leadership roles and emphasizes the application of critical thinking skills in a fast-paced environment. You will be prepared to take on a leadership role in numerous healthcare settings, including hospitals, clinics, community agencies, and healthcare businesses. While courses vary depending on your chosen concentration, the best online master's degree in nursing administration programs typically offer a curriculum with following core courses. These courses emphasize knowledge of theoretical foundations, scholarly research, and practical skills training. Advanced Professional Nursing Practices: This course emphasizes the integration of theory and practice, and students are familiarized with contemporary approaches to nursing and healthcare administration. This course equips students with skills needed to evaluate and improve the current nursing practices of organizations, and prepares them for roles as leaders in a variety of healthcare settings. Evidence-based Practice: This course teaches students how to examine research and utilize data when implementing healthcare practices. Students learn about various types of data analysis and when to use it. The course familiarizes students with academic writing and literature reviews. Skills gained through this course are important for careers in nurse consulting and program evaluation. Healthcare Finance: This course focuses on resource allocation and business planning. Students gain skills necessary for nursing management roles and learn how to create budgets, analyze financial statements, and develop healthcare business models. Students who complete this course are able to manage patient fees and billing and monitor budgets. HOW LONG DOES IT TAKE TO GET AN ONLINE MASTER'S IN NURSING ADMINISTRATION? A master's in nursing administration online takes approximately two years to complete. Factors that impact program length include prior degree level and concentration and field experience requirements. Some nursing programs offer an ASN-MSN track, allowing RNs to earn a master's degree without having to complete a bachelor's program first. This track extends the length of the program by requiring the completion of 15 additional credits. The average MSN program length for students who hold a bachelor's degree is 36 credits, and online students are either part of a cohort or move through the degree at an individual pace. In cohort programs, students progress through a fixed sequence of coursework together and must adhere to a specified plan of study that emphasizes teamwork and interactive learning. Self-paced learning allows students a more flexible schedule, and peer interactions and support are available but usually not mandatory. Certified Nursing Home Administrator: Graduates of a master's in nursing administration online program can pursue a career in nursing home management. Licensure is awarded by the NAB, and certification prepares nurse administrators to operate long-term care facilities. The certification process consists of two exams that include core knowledge and line of service questions. Nurse Leader Certification: Nursing administrators can become certified in executive nursing practice, a credential that emphasizes expertise in leadership, business skills, and professionalism. The certification program is available through AONE, and applicants must possess valid registered nurse licensure, a master's degree, and two years of experience as an executive nurse. Attending an accredited program ensures that your education adheres to professional standards. Regional accreditation is the gold standard for quality higher education. There are six major regional accrediting bodies in America. National accreditation has historically focused on vocational training, and nationally accredited academic programs are not as standardized as regionally accredited programs. While nationally accredited programs are on average more affordable than regionally accredited programs, regionally accredited programs have greater transferability and are more accepted by advanced degree programs. Online programs that are accredited by the DEAC and regional accrediting agencies such as SACS, NCA, and MSA adhere to rigorous standards and provide students with quality education that meets the criteria of the accrediting body. Accredited nursing programs follow guidelines provided by accrediting bodies that promote best practices in healthcare management. Nurse education programs are accredited by agencies such as AUPHA, CAHME, and CCNE. The U.S. Department of Education (ED) and the Council for Higher Education Accreditation (CHEA) play important roles in the recognition and review of accrediting agencies. Accrediting agencies recognized by ED allow students to apply for federal financial aid. CHEA provides quality assurance and promotes the academic integrity of higher learning institutions and programs. More than 3,000 universities are members of CHEA, and the organization advocates for students and their families through public service initiatives. Academic programs that are accredited by ED or CHEA are more desirable than unrecognized agencies. Employers favor graduates of accredited programs, and many graduate programs only accept applicants with degrees from accredited institutions. ED and CHEA provide comprehensive databases of accredited schools and online nursing administration programs.